Rotary in Cumbria and Lancashire were awarded £4,000 from the Abbeyfield Society Community First Fund to hold the first Community Health Mela in Carlisle city centre. The health awareness fair featured a wide range of activities to promote health and wellbeing. Activities included practising first aid skills, learning how to prepare healthy meals and taking part in exercise sessions. A key element of the day was the ‘Health MOT’ which gave visitors the opportunity to have a comprehensive health check that covered BMI, blood pressure and cholesterol levels. People were then given appropriate advice and signposting. 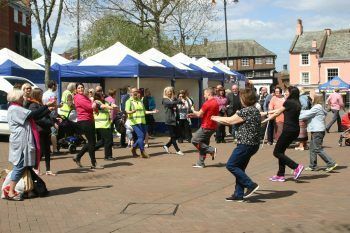 The Mela was run in partnership with the National Forum for Health and Wellbeing and Sustainable Carlisle. Stallholders included NHS representatives and local voluntary organisations. The event was primarily aimed at ‘hard to reach’ individuals who do not ask for advice or support for their own health and wellbeing and may not attend check-ups at their local GP surgery. The event also benefited healthcare professionals and students in the area who were able to develop their knowledge of public health and network in a community setting. Kevin Walsh, Past District Governor for Rotary in Cumbria and Lancashire, said: “Stallholders felt that the event was a good way of reaching the local community and promoting health services. We have already had several requests for details about the next event. “115 people took the ‘Health MOT’ and 35 of these were advised to see their GP, some with potential diabetes. We are aware of one individual who has lost over a stone in weight and changed their approach to exercise.